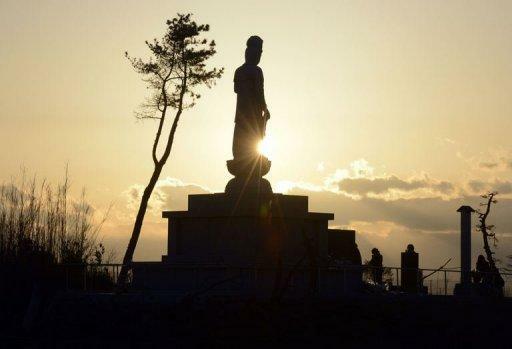 A Buddhist statue recently built in honour of tsunami victims is shown in Sendai, Miyagi Prefecture on March 11, 2013 on the second anniversary of the March 11, 2011 earthquake and tsunami disaster. Japan said Tuesday it was "disappointing" China did not send anyone to a ceremony marking the second anniversary, in the latest sign of deteriorating ties between the two countries. 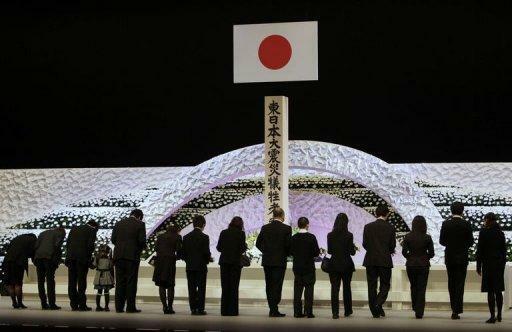 Japan said Tuesday it was "disappointing" China did not send anyone to a ceremony marking the second anniversary of its tsunami, in the latest sign of deteriorating ties between the two countries. Beijing's apparent snub came after Japan invited representatives from Taiwan to take part on an equal footing with other diplomats in the national remembrance for people killed by the 2011 quake-tsunami. The move also came as tensions between Tokyo and Beijing simmer over a territorial row, with Chinese government ships on Tuesday spotted in disputed waters, the latest salvo in a spat over the sovereignty of uninhabited, but strategically vital, islands. "The Japanese government explained to China that we would treat Taiwan appropriately in this ceremony considering its enormous support to us," Chief Cabinet Secretary Yoshihide Suga told reporters. Tokyo told Beijing "that this would not change Japan's position over the status of Taiwan as stipulated in the Japan-China Joint Communique", he said. "But China didn't understand and was absent from the ceremony, which is extremely disappointing and a great pity," he said. China considers Taiwan a renegade province and aims to bring it back under control, using force if necessary. In the 1972 joint communique, Japan recognised China "as the sole legal government of China". China's foreign ministry said in a statement Monday that Beijing had expressed opposition to Japan's move in which it "treated a representative from Taiwan the same as diplomatic envoys and members of international institutions." On the first anniversary of the disaster, Japan's then-government, led by Yoshihiko Noda, excluded Taiwan's representative from a list of countries and territories read out at the ceremony. However, Japan's representative office in Taipei published half-page "thank-you" advertisements in major newspapers on the island, recording the government's gratitude for aid from Taiwan that local media estimated came to around $224 million. Relations between Beijing and Tokyo have deteriorated badly over the last year as the two sides have bickered over the sovereignty of Tokyo-controlled islands in the East China Sea. 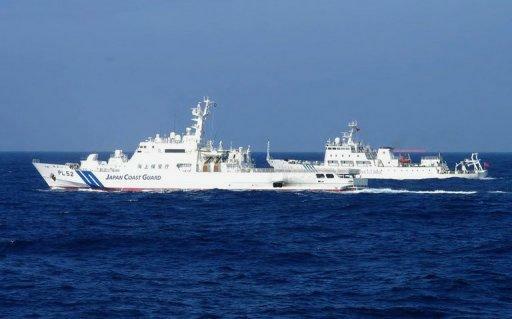 Three Chinese government ships entered the 12-nautical-mile territorial zone off one of the Senkaku islands shortly after 10:00 am (0100 GMT) on Tuesday, Japan's coastguard said in a statement. Beijing claims the islands under the name Diaoyus. Taiwan also claims them. Suga said told the press conference that no diplomatic representative from South Korea had been at the tsunami ceremony, in which a minute of silence was observed in commemoration of the more than 18,000 who lost their lives in Japan's worst post-war disaster. However, he said Seoul informed Tokyo on Monday its envoy's absence was due to a clerical mistake. Japan and South Korea have a dispute over a different set of islands, which sit in the sea midway between the two nations.